When recorded audio first found its way into American homes via Thomas Edison's phonograph, the playback devices were mechanically powered. Large, tapered horns were used to project sound (See the photo on the right). 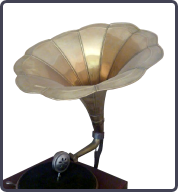 In 1898 Oliver Lodge invented a "bellowing telephone" loudspeaker which was very similar to the modern, common cone speaker. However, because electrical signal amplification was not possible until the invention of the triode vacuum tube in 1906, Lodge's "bellowing telephone" wasn't used as a loudspeaker for any audio system. Later, in the 1920s, Bell Laboratories began to develope an audio system to playback the newly invented, electrically cut phonograph records. Bell Laboratories developed many speaker prototypes including designs based on Lodge's cone, as well as electrostatic type loudspeakers. Due to the large size of the electrostatic design, Bell Laboratories ultimately went with a cone design. The moving-coil (dynamic) cone speakers developed by Bell Laboratories laid the foundation for the common cone speakers we use today. In the 1930's, theaters began implementing two-way sound systems that featured a large subwoofer, a crossover network, and horn which covered high frequencies. It would be another 30 years before multispeaker systems evolved into the home audio systems which are so commonplace today. Many of us own or have owned 2.1 systems. These are those common home theater, stereo system, and computer speaker set-ups that have two satellite speaker boxes and a separate subwoofer enclusure. In many cases, an amplifier is included. These common 2.1 systems are rooted in design concepts pioneered by Paul Weathers. His Compass Triphonic System, introduced in 1968, featured a pair of satellite speakers and a subwoofer similar to a modern 2.1 system. An audio speaker. Typically, "driver" refers to active speakers (not passive radiators). Drivers which reproduce high, mid, and low frequencies. NOTE: Humans can typically hear frequencies ranging from 20Hz-20,000Hz. Just because a driver is called "full-range" does not mean it can reproduce all frequencies we can hear. 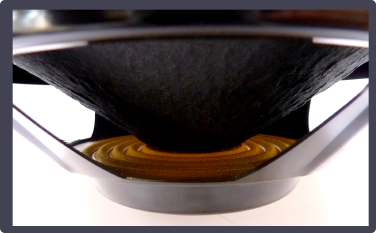 "Full-range" just means the driver can reproduce some (not all) high, mid and low frequencies. Drivers which reproduce high frequencies. Drivers which reproduce mid-range frequencies. Drivers which reproduce low frequencies. 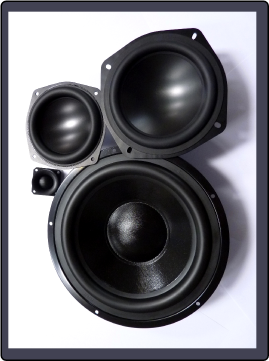 If you're considering building your own audio system, we highly recommend checking out Parts Express. They have everything you'll need to understand, design, and build a great system.